Want to Build Your Own Grist Mill? Oliver Evans Explains It All! Have you ever daydreamed about the books you'd like to have with you in the event you might need to rebuild civilization all over again someday? If so, The Young Mill-Wright & Miller's Guide, written in 1795 by Oliver Evans (1755-1819), should be on your list. This book was instrumental in shaping America's industrial future, during a time when the frontier was located just along the west of the mid-Atlantic states. Born and raised in Delaware, young Evans taught himself mathematics and the fundamentals of engineering while learning the practical skills of wagon-making and textile manufacturing in the bustling city of Wilmington. His knack for coming up with creative solutions for improving mechanical processes would be helpful in any time period, but especially in the late 18th century when the American population was growing and expanding into new regions. As communities developed, residents needed mills to grind their grain into flour. However, the technical knowledge required to build and run mills was not easily acquired without spending years as an apprentice. Land-grant colleges to educate students in the subjects of engineering and agricultural science were not created until the 1860s, and the few American institutions of higher learning available in the 18th century were expensive, exclusive, and did not emphasize the study of the mechanical and practical arts. The Young Mill-Wright & Miller's Guide explains the basic concepts of engineering, hydraulics, surveying, arithmetic, and business management so clearly that bright students with little more than an elementary education and a natural mechanical aptitude can understand them. 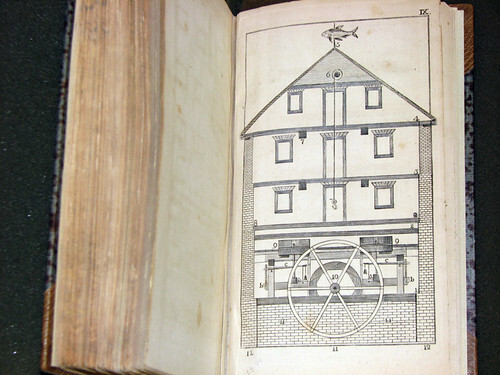 The book is filled with instructions on how to select the best site for a mill, divert a mill-stream, construct the gears, pulleys, chutes and other necessary infrastructure, hire and train employees, negotiate with suppliers, and arrange for the transportation of the raw and finished products. Part 5 of Evans' book, subtitled "The practical mill-wright, containing instructions for building mills, with tables of their proportions suitable for all falls from three to thirty-six feet," was compiled from information supplied by Thomas Ellicott, a miller whose family business helped to develop the town of Ellicott City, Maryland and whose knowledge of a working mill operation provided a useful supplement to Evans' innovative ideas on ways to improve the traditional mechanical design of mills. 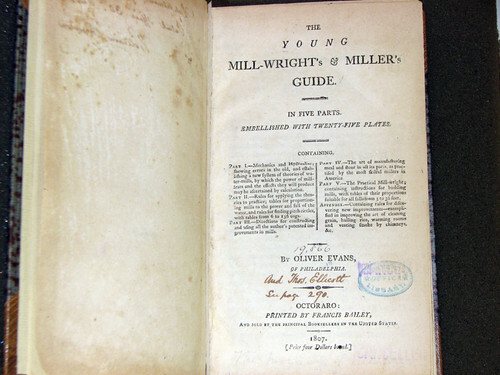 The Smithsonian Institution Libraries has several early and modern reprint editions of The Young Mill-Wright & Miller's Guide in its collections, including the first (1795) edition. Of particular interest are two copies of the 1807 edition from the Dibner Library of the History of Science and Technology. The 1807 edition has a slightly modified title, The Young Mill-Wright's & Miller's Guide, with the imprint "Octoraro [i.e. Octorara]: Printed by Francis Bailey." Bailey was the official printer of the state of Pennsylvania, and he ran printing shops in both Philadelphia and in his home town of Octorara in Lancaster county. There are two different issues of the 1807 edition, which differ slightly in their type-setting (one notable difference is that the variant issue has the phrase "[Price four dollars bound.]" appearing on its title page). The Dibner Library has a copy of each issue. The Dibner copy of the standard issue is well-used and missing some of its plates. The book formerly belonged to a family of millers named Switzer, whose ancestors settled in the foothills of Virginia's Blue Ridge Mountains. Two handwritten inscriptions on the preliminary pages suggest that this text was a prized guide for running the family business: 1. "Calvin Switzer, January 5th, [18…], price 550 cents", and 2. "Used by gr. gr. father David Switzer, in the operation of his water-power mill in Madison County, Virginia, gift of Miss Edna Switzer, October 25, 1940." 2. 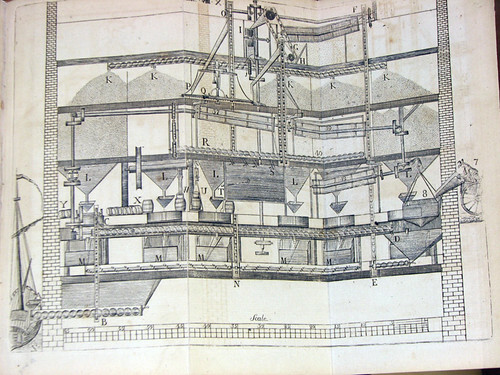 Plate from the 1807 variant issue, with a detailed diagram showing the inner workings of a grist mill. You can visually track the route taken by the grain from its receipt in raw form at the lower right corner, through the grinding process, to the end when the ground meal is poured into barrels and loaded onto a waiting ship in the lower left corner. 3. Another plate from the 1807 variant issue, with a cross-section of the wheel mechanism. The jaunty fish-shaped weathervane at the top of the building is a particularly whimsical touch. 4. 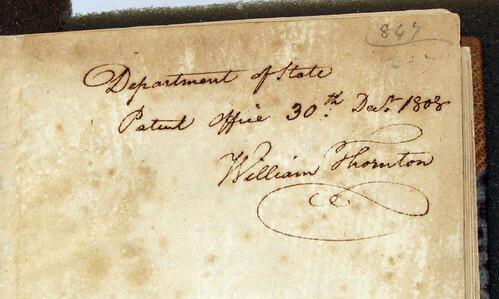 Handwitten inscription of William Thornton, appearing on the front free endpaper of the 1807 variant issue. One of the most important old buildings is the Grist Mill. It is 250 years old and It has many different uses. One of them is grinding grains such as wheat, rye, oat and or barely into flour and meal. Many early water wheels were enclosed inside of the building or under roof for protection from winter’s snow and ice. When corn is milled into corn meal the bran is sifted out to make bolted corn meal. There are two types of mills or milling operations. Custom mills is most often referred to as grist mill. These mills operate seasonally with the harvest. Custom mills grind grains individually for farmers and other individuals. The miller is paid for his services of milling by collecting a toll. A toll is a portion of the grain brought to the mill for grinding. The machinery of the mill is simple, often only one pair of millstones, but sometimes two pairs of millstones are found in the mill. The other type of mill is a merchant mill. A merchant mill Is a commercial milling operation. The miller or millers is generally not the person or persons who own the mill or constructed it. This mill grinds grain and produces flour for profit and for export. This mill does not grind grains individually for farmers and other individuals. It grinds wheat and produces white flour packaged into barrels, rather than a custom mill that would grind sacks of grain. Elijah Craig built a fulling mill, a paper mill and a grist mill in Scott County, Kentucky between 1786, the year he came to Kentucky from Virginia, and 1808, the year he died. I am writing about him and I want to describe the mills in my paper. How could he, a self described unlettered man, have the ability to build the mills?